For Immediate Release: Posted On 4/26/2011 By Industrial Magnetics, Inc. 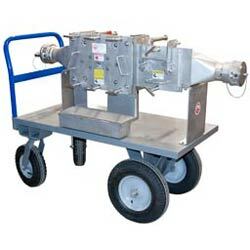 The cart mounted Pneumatic Line Housing(PLH) from IMI not only improves product purity and protects processing equipment from tramp metal damage, but its portable design allows it to be utilized in multiple applications within the same facility. Incorporating a series of 1-in.-diam, 50 MgOe rare- earth magnetic tubes on staggered centers, the PLH’s configuration ensures that all product flowing through the housing makes repeated contact with the magnets. The resulting capture rate of ferrous and weakly magnetic stainless contaminants far exceeds any other magnetic separator available for this type of application, including the single, center-flow cartridge circuit often prescribed for pneumatic line systems. Available in EZ-Clean or Self-Cleaning configurations for easy removal of collected metal, the cart mounted PLH also incorporates a removable screen that is available in different mesh sizes to catch non-magnetic lumps of material. Standard line sizes range from 3" - 10" in dia. with modified and custom designs available upon request. Visit the Pneumatic Line Housing product page for more information or call 888.582.0821 to speak with an IMI product specialist.